Designed by Physiotherapist Heather Rhodes from first principes, the Pacerpole is based on anatomical and biomechanical analysis. In practical terms its contours form half an artificial joint (the other half is the relaxed hand). It controls the arm stride action, as a lever to lift the trunk upwards and forwards reinforcing better body posture, better dynamic stability, support and propulsion. Effective power transmission so you perform at your best whatever your fitness level. The Pacerpole's arms stride action trains the shoulder girdle muscles to work together to hold it in-place ... as a good habit i.e. these repetitive actions reprogramme the poor postural habits of rounded shoulders and a forward stoop to achieve a better body posture (see film clip below). Click and drag the handle to rotate it. Adobe flash required. 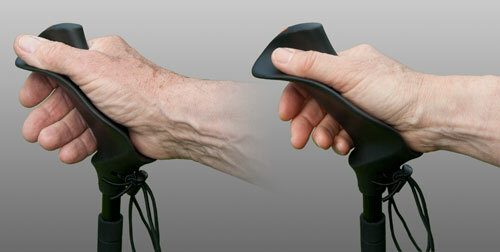 The Pacerpole handle design is unique. Its complex shape is not arbitrary - and results from a deep understanding of anatomical and biomechanical dynamics of our arms leverage as it walks stride for stride above the legs. It is why Pacerpole’s don’t need straps or springs, why their handles are angled and handed Left and Right, and why they can lift the trunk upwards and forwards hour after hour when used properly. It’s no coincidence that our primitive footwear was shaped the same for either foot until someone made the first Left boot and then a mirror image Right one. It was obviously a great success in improving performance; we’ve been using them in pairs ever since. Now it’s the arms turn to boost performance: Pacerpoles are designed to integrate with the body as a natural extension - so you benefit from effective arm leverage without wasting effort and become an efficient “Double-Biped” as you Walk-Tall. The contours of the Pacerpole handle control the forearm pronation (the rolling inwards action) to keep it in its midline as an effective lever - without wasting effort, which would happen if it continues to pronate each stride ....just like the lower leg and foot continues to pronate (rolling inwards) when walking on soft sand; this is also tiring and wastes effort so you underperform. Thumb in continuous contact with the contoured thumb shelf controls rotation of the forearm so it remains in mid-alignment throughout i.e. during and after thrust. The continuous ledge from the thumb tip to the end of the little finger is a spiral which can accommodate different hand sizes.